SAN DIEGO — Hailing the Port of San Diego as a “big player,” Board of Port Commissioners Chair Dan Malcolm took the helm of one of the biggest waterfront venues in the United States earlier this year. Speaking with The Log less than two weeks into his tenure, Malcolm said he hopes to maintain Port of San Diego as a leading commercial and recreational destination. Malcolm, a lifelong boater who now works in commercial real estate, set the tone for his one-year term as Board of Port Commissioners chair by citing the port as a regional economic engine with a $7.6 billion impact and producer of more than 58,000 regional jobs. As chair of the Board of Port Commissioners, Malcolm said his priority is to balance economic vitality with environmental stewardship. Balancing economic growth with environmental sustainability appears to be the cornerstone of his theme for his one-year term, which he announced after he was sworn in Jan. 13. The theme, “Port of San Diego: Regional Economic Engine,” is not limited to the port’s commercial tenants, Malcolm said. Port of San Diego being a “regional economic engine” means recreational boaters will have plenty of recreational opportunities. “I am a lifelong boater. Whether I’m cruising or sailing, I am on the water an awful lot,” Malcolm said. He added boaters will be able to access several recreational activities from the water, such as dock and dining. “There are a lot of opportunities for boaters to come down here. Once you get ashore, there are a lot more recreational activities to do … all of it accessible from the water,” Malcolm said. The chair reminisced about his wedding day on San Diego Bay, about 14 years before he joined the Board of Port Commissioners. Malcolm said he and his wife spent their first moments as newlyweds aboard a boat, cruising away from the marina where they wed.
One area in San Diego Bay where more waterfront weddings might occur would be Chula Vista, where a redevelopment project aims to revitalize the area surrounding Chula Vista Marina. Though the project is still in its infancy and the final plans have not yet been developed – let alone approved – Malcolm said the bayfront redevelopment should have a positive impact on recreational boating. He added marinas such as the one in Chula Vista are key elements to promoting any sort of waterfront recreation. Malcolm also cited boatyards as an integral element of the port. “We are as good as it gets with boatyards and boat facilities. 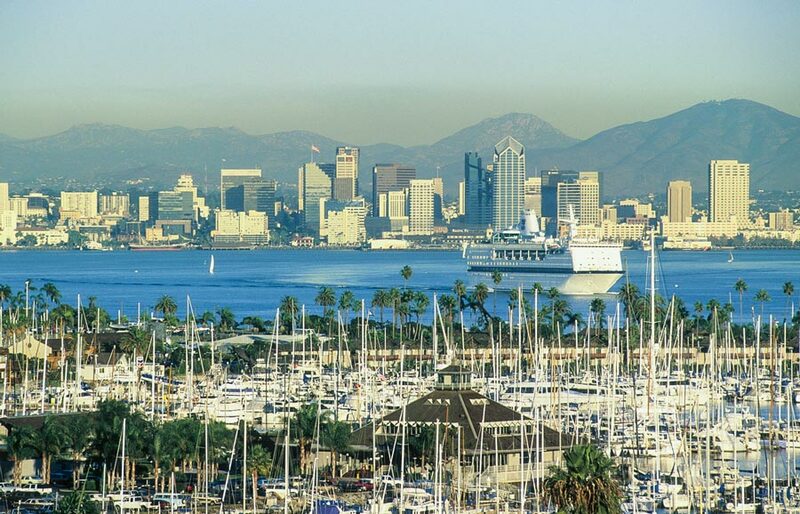 A lot of boats stop in San Diego and utilize our boat repair services. It’s a big part of the port,” Malcolm said. One ambitious project that probably won’t happen: connecting Port of San Diego to Mission Bay. As it stands today, a boater who wants to access Mission Bay from Port of San Diego would have to exit San Diego Bay at Point Loma and enter northern the waterfront from the ocean near Pacific Beach. According to Malcolm, an alternative route, such as a north-south channel cutting through a segment of land between the two bays, would not be a viable option. “It probably is not possible or viable. It would be a really tough project. While I love to dream big … about an unconstrained project, we really have to spend our time on projects that are real, projects that provide a return on investment,” Malcolm said, adding too many economic and legal constraints exist to directly connect Mission Bay to Port of San Diego. One issue potentially impacting the port is sea-level rise. A handful of studies have analyzed the potential impacts of sea-level rise in coastal San Diego, though each predicted a different result. For example, the San Diego Foundation recently published “A Regional Wake-Up Call,” which studied sea-level rise and predicted sea level in San Diego County could rise 12 to 18 inches by 2050. In 2012, the International Council for Local Environmental Initiatives (ICLEI) projected the sea level would rise 10 to 17 inches statewide by 2050. The report also listed Coronado Cays and a portion of San Diego near Southwestern Yacht Club as potential areas of concern. Malcolm, speaking for himself, expressed caution in pursuing a policy protecting against sea-level rise. “The way I view it is we need to be careful, rational and scientific. We have to pick a scientific approach. There is a significant variability, a large delta, in what kind of sea-level rise we can expect,” he said. Malcolm suggested one way to scientifically predict rising oceans is to make regular observations of what is currently happening and compare the results to the various studies. If there is a congruency between what is happening and what was predicted, then a strategy to mitigate the problem can be developed. “No study is predicting catastrophe. We don’t want to chase a problem that ultimately doesn’t exist,” Malcolm said. The Board of Port Commissioners chair pointed out Port of San Diego “has been a real leader in environmental stewardship” and was among the first waterfront regions to implement a climate action plan and study adaptation strategies. Beyond economics and environment, another hot topic for the port is safety and security. Last year, the San Diego Harbor Patrol developed an iWatch program – basically a neighborhood watch on the water. The program was modeled after a similar version in New York City. San Diego’s iWatch program urges the public to interact with law enforcement to better address criminal activity on the water, such as panga boat smuggling. Malcolm urged boaters to be proactive with iWatch. “It’s no different than what we tell people on land. Every boater plays a part. Boaters have to be more observant of their environment. You constantly need to be observing and analyzing your surroundings,” Malcolm said, adding boaters should report anything that looks out of place to Harbor Patrol or other law enforcement. Of course, Malcolm and his colleagues will discuss other major items during his tenure as chair, which will be complete in January 2016. Malcolm joined the Board of Port Commissioners in January 2011 as a representative for the city of Imperial Beach. He is also president and CEO of Malcolm Properties, a commercial real estate firm. The Board of Commissioners chair previously served on the Imperial Beach City Council, San Diego Metropolitan Transit Development Board, San Diego County Commercial Association of Realtors, South County Economic Development Council, San Diego Association of Governments and Sweetwater High School District Bond Oversight Committee. He is a graduate of San Diego State University and Thomas Jefferson School of Law.